Like many of you, when it was ridiculously cold last week, I went into survival mode. In addition to filling my gas tank and changing my furnace filter, I also made sure we had plenty of wine in the house along with lots of delicious food so we wouldn’t have to venture outside. I knew I wanted to make a deeply flavorful and hearty stew to ward off the cold, but I had a hard time narrowing down my options. I decided to use curriculum from our very own Winter Soups and Stews class for inspiration, and that lead me to Beef Paprikash. You've probably heard of chicken paprikash, the well-known Hungarian dish named for the ample amount of paprika used in the recipe. Beef paprikash, otherwise known as beef goulash, is similar because it includes the use of paprika, but tomatoes and peppers also play a leading role in this very comforting stew. 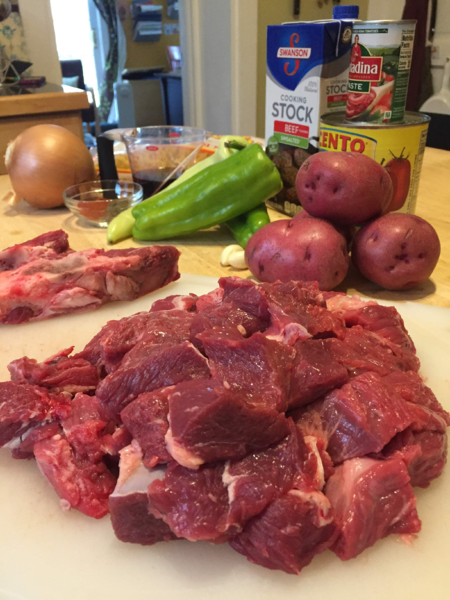 Let's go through the steps to make this pot of deliciously braised beef. On a side note, braising is one of my absolute favorite cooking techniques because it produces extremely flavorful, tender, falling off the bone meat. 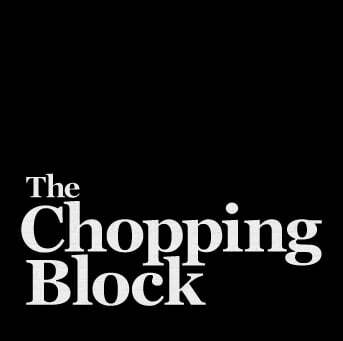 The first step in the recipe is to brown the cubes of chuck until golden brown on all sides. 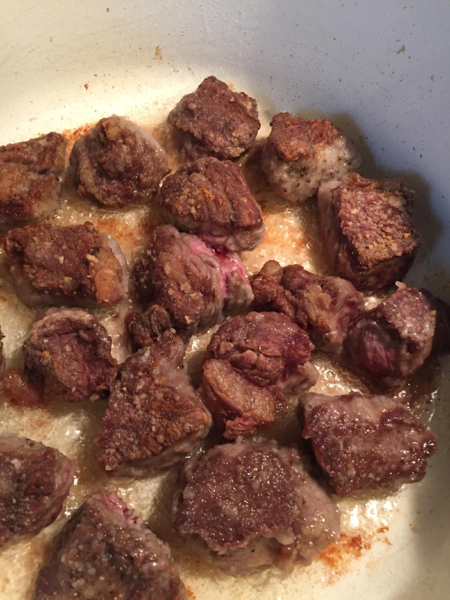 We use chuck in this recipe because it has a good amount of connective tissue, which will result in a flavorful-yet-tender finished product. After dredging the seasoned chuck through all-purpose flour, I browned it in my Le Creuset French oven (the perfect pan for making braises), until golden brown on all sides. I ended up doing this step in batches to prevent overcrowding the pan. Cooking Tip: make sure your pan isn't too hot while browning the beef, or you'll end up with burnt spots on the bottom of your pan. An even medium heat is sufficient. Once all of the beef has been browned, it's time to sauté the onions until caramelized around the edges. 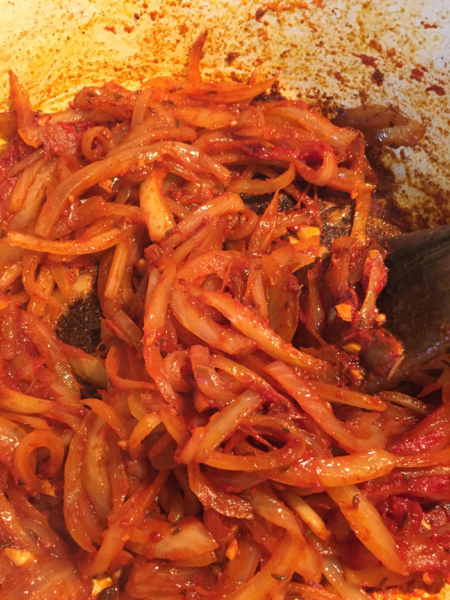 Once the onions are ready, add the spices and tomato paste. These only need to cook until aromatic, so 1 minute should do the trick. 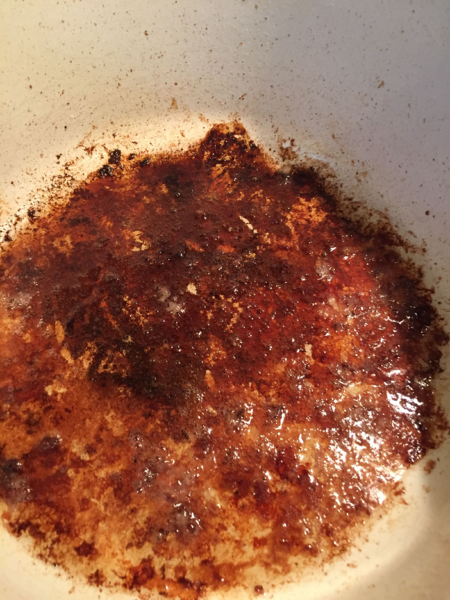 I love this step, because it's your opportunity to remove all of the delicious browned bits of fond from the bottom of the pan, which adds an incredible depth of flavor to the finished product. Deglazing typically involves a flavorful liquid like wine or vinegar, and in this case we use red wine. 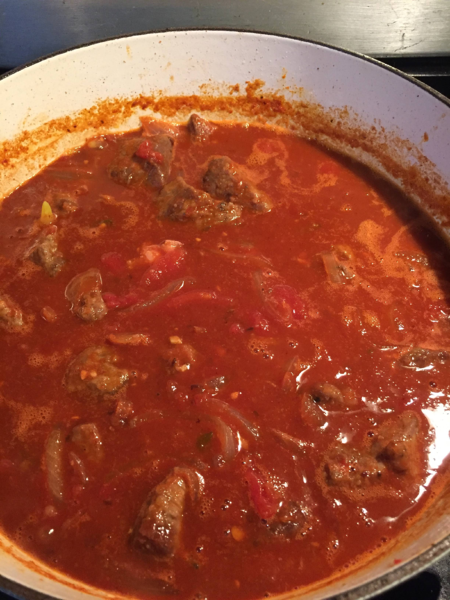 Canned tomatoes and beef stock are the two main ingredients that make up the bulk of the stew. The tomatoes not only add flavor, but the acidity will help break down the tough beef. 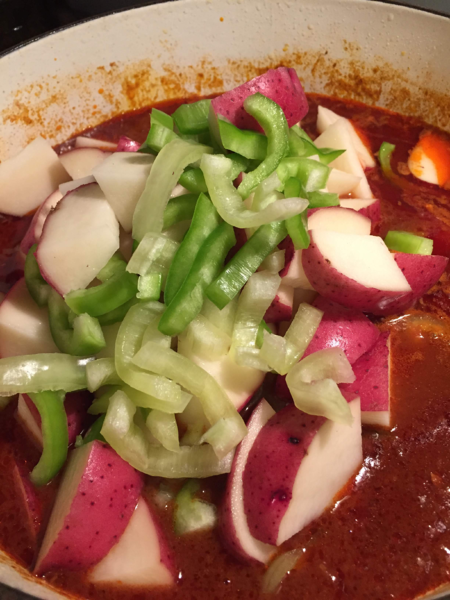 Additionally, the beef stock adds a great layer of richness and savoriness to the stew. Once the stew comes to a boil, reduce the heat to a very gentle simmer. Cook, covered, until all of the connective tissue has been broken down leaving you with very tender beef. This step typically takes about 2 hours, so go watch your favorite show and/or take a nap! Half an hour before you plan on serving the stew is when it's time to add the finishing touches. Stir in the potatoes and peppers, and continue to cook until the potatoes are tender. Ensure the seasoning is spot on. I like serving this stew with buttered egg noodles, but fluffy mashed potatoes or steamed rice would be excellent options, too. Heat a wide, heavy pan over medium heat, and add the grapeseed oil. 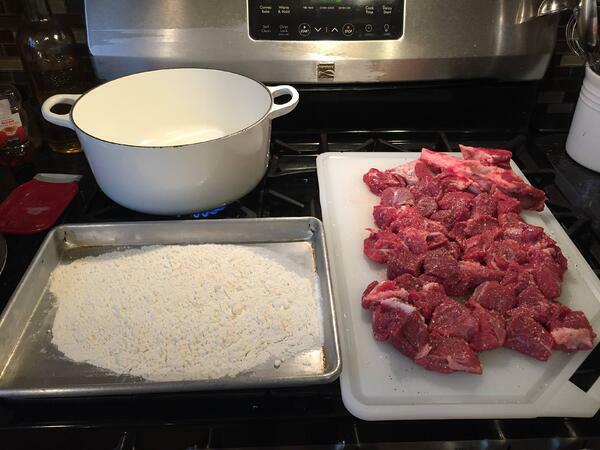 Season the beef with salt and pepper to taste, and lightly dredge through the flour. Sear the beef, in batches, until golden brown on all sides. Set aside on a plate. Tip: if the pan seems dry, add more grapeseed oil as needed. Sauté the onions until caramelized around the edges, 5 to 6 minutes. Add the garlic, caraway seeds, Hungarian paprika and tomato paste, and cook an additional 30 seconds to 1 minute, or until aromatic. Deglaze the pan with the red wine, scraping free the browned bits of fond from the bottom of the pan. Return the beef to the pan along with the tomatoes and beef stock. Bring the braise to a boil, and reduce the heat to a simmer. Cook, covered, until the beef is tender, about 2 hours. Stir in the potatoes and peppers, and continue to cook until tender, about 20 minutes. Toss the warm egg noodles with the butter, and place in shallow bowls. 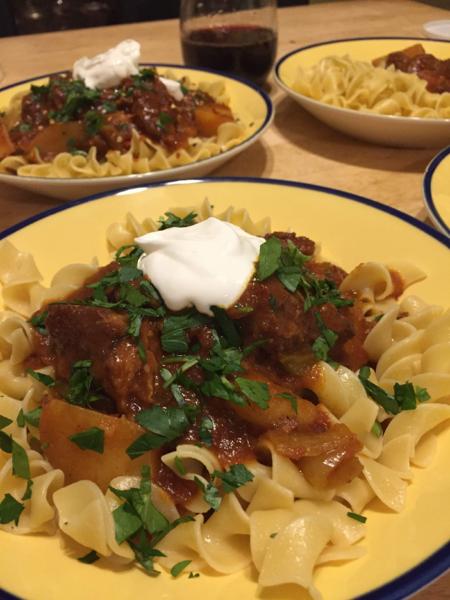 Top with the beef paprikash followed by a dollop of sour cream. Winter isn't over, so keep this recipe close in case of emergency! You'll find this recipe along with several other comforting recipes in our Winter Soups and Stews class on February 23rd at our Lincoln Square location. 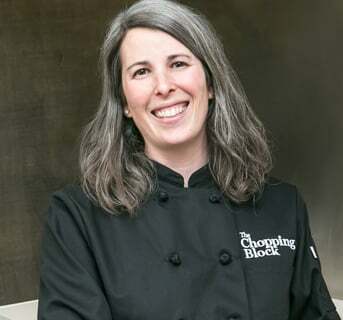 If you're looking for additional classes featuring soups and stews, look no further! We're running our popular Cast Iron and Crock Pot Cookery class in February and March, and Seasonal Soups and Stews in March. For the ultimate lesson in braising, check out our Braising Boot Camp coming up in a couple of weeks. This cooking technique will help get you through winter!